I’m providing these prepping snowmobile tips and how-to snowmobile video. Why? Because everyone should be getting prepared to ride as the fall snowmobile magazines arrive or if snow conditions are ready early. Not scrambling at the last minute. This way, if you discover anything major that needs attention, you’ll have time to rectify it before the snow flies. 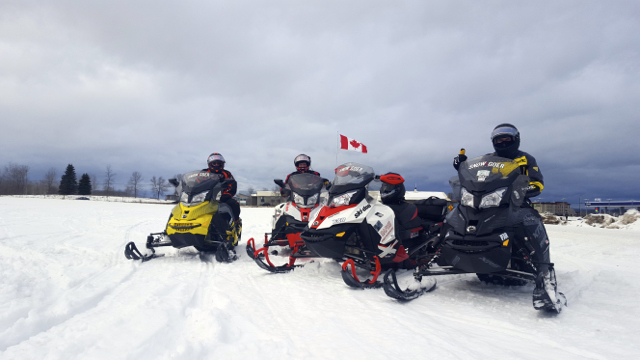 Once snow conditions are good, you don’t want any down time caused by snowmobile problems. So eye-ball every wear part to confirm its good to go as is, make it good as new or replace it. An ongoing maintenance log helps keep me aware of what’s been done when and what’s up next. 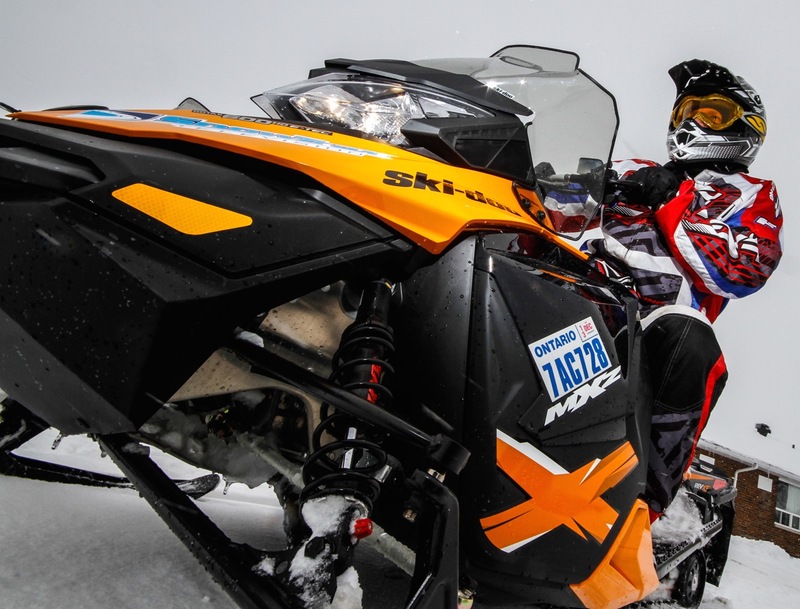 For those more mechanically inclined, check out more sled maintenance tips here. And remember, the best way to get ready starts with good summerizing. 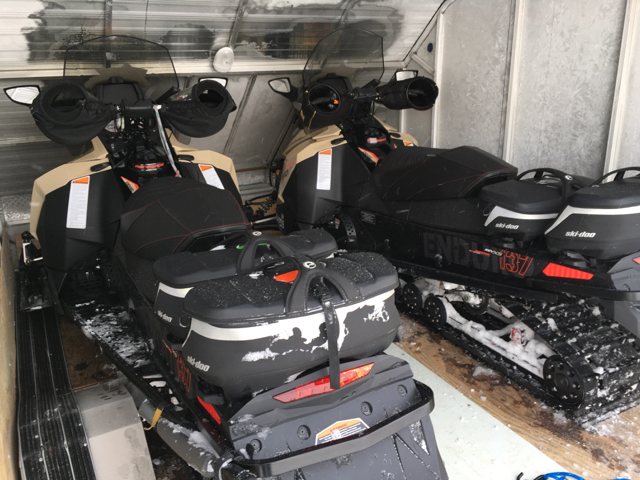 If you’re a trailer person, you want to ensure getting to your snowmobile tour destination every time, with your snowmobiles in one piece. That means checking all major components of your trailer early. This includes tires, bearings, hitch and chains, axle and springs, bed and cover, lights and electrical early. I’ve had excellent performance from my Triton trailer. 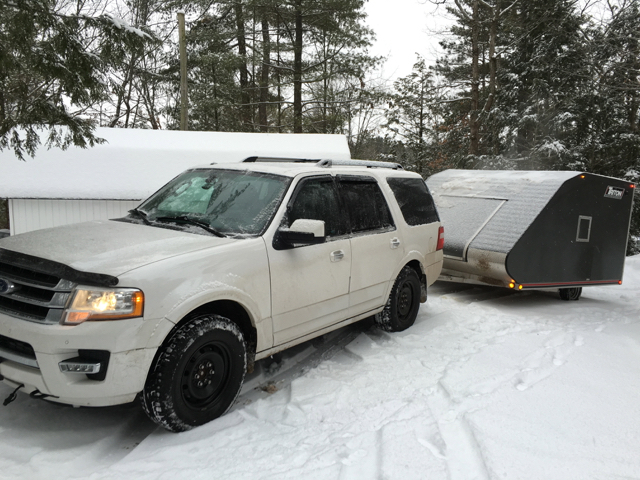 Unlike your sled and trailer, your tow vehicle has been used constantly since last winter. So you should do a complete winter service, including installing snow tires. Be sure to remind your mechanic that you’ll doing more winter driving than most people. Plus a lot of towing in all kinds of snow conditions. So pay special attention to all tow package components. Also pack your winter emergency kit. Make sure everything is fitting and functioning properly. I inspect all fasteners. This includes straps, seams and making certain that everything still fits my body and sled (especially important if you’ve changed sleds since last winter). This way, you also know if anything is missing from your riding inventory and needs to be replaced. It’s always fun to start planning where you’re going to ride. Early prep allows you to compare destinations and routes, schedule dates and confirm companions. Plus have back ups plans ready, just in case snow conditions change. Early planning also enables you to provide priority notice of being away to family and business associates. And yes, taking care of business during the fall is your best guarantee of being able to ride uninterrupted all winter! Pay attention to your snow machine, because you need it to get back. Do a once-over inspection prior to each trip, before leaving home. Carry spare plugs, belt, gas line anti-freeze and a basic tool kit This includes duct tape, plastic ties and wire. And don’t set out without full gas and oil tanks — and knowing where your next fill-up is. Make note of your departure time, route, expected lunch stop and return time. Update it from the trail if changes occur. Make sure your cell phone has a full battery charge. If you have electric start and a 12-volt outlet, carry a cord to plug into your sled. If there’s someone at home (or an answering machine), check in at lunch and again at your last pit stop before returning. It’s also a smart idea to give everyone in your group a “lifeline” number to call if you become separated. That way, even if they can’t get in touch with you, a third party will know where everyone is. Make certain all riders have a map, compass and that there’s at least one GPS. Always carry a basic survival/first aid kit and a stout piece of rope at least 20 feet/6.1 m long. Next, prepare yourself for a ride that could go wrong. If you always wear water and wind proof outerwear, you’ll never get caught short if the weather suddenly changes. Dress for the coldest part of the day. Be prepared to take off/put on layer(s) as needed. I suggest riding with a bag that has room for that extra fleece or jacket liner. I also have a handle bar bag, which contains work gloves, a bottle of water, sunglasses and a roll of toilet paper, among other essentials. On my person, I carry a pocketful of chemical hand warmers, fire starter materials, plus a granola bar or two, lip balm, Tylenol and antacid tablets. CLASSIC VIDEO! Get ready with this classic Snowmobiler Television video clip from The Intrepid Snowmobiler. You can’t anticipate everything, but if you cover off the items on this list, your odds of having a trouble-free season will be mighty good. Now just pray for great snow conditions! Check out more planning tips!